← One More Time: What Drives SaaS Company Valuation? Growth!! Two weeks ago, Host Analytics launched an amazing new product called Modeling Cloud. Built by an elite team of some our most experienced developers, Modeling Cloud represents a breakthrough in cloud enterprise performance management (EPM). In this post, I’ll discuss why Modeling Cloud matters to customers, to the market, and to the company. Ability to build non-financial models. Planning and budgeting tools are built for planning and budgeting. As such, you want them tied to the general ledger (GL) so, for example, you can easily get actual vs. plan for periodic reporting. But that requires a level of financial intelligence that can become cumbersome; in a typical planning system every line needs to tie to an account in the GL, be a debit/credit account type, be associated with a legal entity, and have an associated currency. That intelligence, which is so wonderful when making budgets, becomes baggage when you just want to build a model — for example, of bookings capacity given productivity and ramping assumptions, or new sales model given advertising spend, conversion, trial, and purchase rates. That’s why most models today are built in Excel and completely disconnected from the financial planning system. Ability to integrate non-financial models. The problem with departmental Excel-based modeling is that everything ends up disconnected from the central financial planning. Consulting can tell you what happens to billings if you hire 5 more consultants in the East and sales can tell you what happens to bookings if you hire 6 more salesreps in the East, but you need to start mailing spreadsheets around if you want to see the financial outcomes (e.g., revenue, EPS) of such changes. Enterprise-wide scenario analysis. The beauty of connecting departmental modeling to the corporate financial plan is that you can perform enterprise-wide sensitivity analysis. Say we’re thinking of making a big Eastern region push next year. When the models all tie to the financial plan, we can see the financial outcomes for the company associated with such a push, and what it means to setting expectations with board and Wall Street. This captures the real spirit of what is often called driver-based planning. The bookings-to-revenue bridge. Models can help the finance team better forecast revenue because sales tends to be bookings-oriented whereas finance is revenue-oriented. Everyone knows that given a pipeline of 100 opportunities there can be scores of combinations where sales hits the bookings target, but each one produces different revenue depending on the composition of the orders. This is also, more subtly, true of sales expense because any given combination will consist of a given set of deals, for a given set of products, by a given set of saleseps, and each product may have different incentives on it, and each salesrep may be in a different stage of acceleration in their compensation plan. By modeling bookings and doing scenario analysis of various combinations of orders, finance can better predict revenue, expense, and ultimately EPS. In a world where a minuscule EPS miss can knock off 20% of a company’s valuation in a heartbeat, this is a critical capability. Cloud penetration. EPM is under penetrated by the cloud, with cloud-penetration of less than 5% today. That means that 95% of all EPM systems sold in 2014 (between $3-4B worth) were on-premises. By comparison, sales force automation (SFA) is about 50% cloud-penetrated. While cloud-based planning and budgeting tools have existed for over 5 years, most cloud vendors are still working on completing their suites, with a handful introducing consolidation only in the past one to two years, and just two vendors offering a modeling engine in the cloud. While it’s not the only factor hindering cloud penetration, rounding out cloud EPM suites will definitely help accelerate moving EPM to the cloud. Market penetration. Cloud aside, EPM is an under-penetrated market, overall. 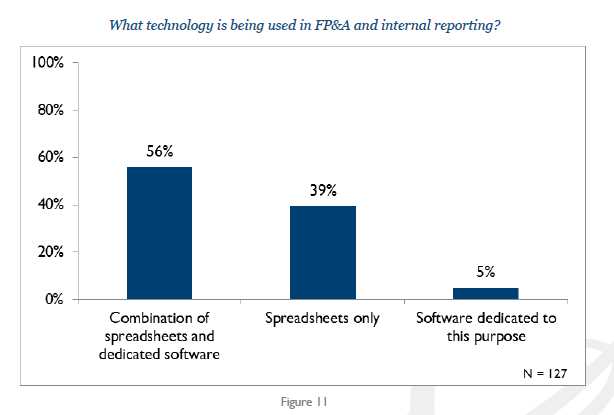 A recent survey by Grant Thornton, 40% of companies reported that they weren’t using any EPM system, relying only spreadsheets for FP&A work. This implies the $3-4B EPM market could nearly double simply by better penetrating target customers. And the best way to penetrate these companies is not by attacking Excel, but instead to bring an intelligent Excel strategy that makes it easy to import and build both budgets and models that are connected to the financial planning system. Customer penetration. EPM is under-penetrated within EPM-consumer companies. Many EPM customers start with a dream of true enterprise-wide planning, but fallback to EPM deployment only within finance and rely on emailed spreadsheets for the “last mile.” That’s too bad because mailing spreadsheets is both insecure and error-prone. This situation develops often in on-premises EPM because the hassle of deploying the software across all potential users is simply too high and because the software itself is built for finance not end users. Cloud EPM — with cloud modeling — will help with improving customer penetration not only because it introduces new reporting and slicer/dicer options, but also because — in the case of our Modeling Cloud product — it introduces the new ability to build and manipulate sub-models which give end users the data they want — and only the data they want — without having to rely on IT for configuration. Unique position. With Modeling Cloud in the product line, Host Analytics now has the most comprehensive EPM suite in the cloud. If you look at our primary cloud competitors, one does low-end planning and budgeting, one does visualization and mobile, and the other does cloud modeling but has only both new and functionally thin applications for core finance. The finance choice. Host Analytics has always been the finance department’s choice when it comes to core EPM (planning, budgeting, consolidation). That’s because experienced finance people understand the depth and breadth that we bring to the cloud and aren’t interested in buying either unproven solutions or solutions that they will outgrow. The operations choice. With Modeling Cloud, Host Analytics is now also the operations choice. Be it sales ops, marketing ops, or services ops, Host Analytics allows ops departments to do the planning and modeling that they require — and to do so in a way that easily integrates with the core financial planning system. This gives them the best of both worlds — the ability to build any model they could build in Excel, using Excel formulas (and even using an Excel front-end if they so desire) and to do so in a way that automatically integrates with the core financial plan. The best architecture. Only Host Analytics offers a true multi-dimensional (i.e., OLAP) backend and an architecture built atop cloud-native, dynamic, elastic, NoSQL technology where we deliver phenomenal multi-dimensional analysis and leverage modern/standard components for managing physical storage, sharding, and parallelism. This provides us with a huge advantage going forward both in terms of productivity and scaleability. It’s been about 2.5 years since I joined Host Analytics and I’m quite proud of the work done by our entire R&D team in industrializing the core products, introducing a new layer of solutions, and now rolling out the industry’s most innovative cloud-based modeling engine. This entry was posted in EPM, Finance, Host Analytics, Modeling. Bookmark the permalink.